Seattle, Washington, is full of things to do and see, from beautiful landscapes and museums to historic landmarks like the Space Needle. Since Seattle is waterfront, there are also a ton of great seafood restaurants throughout the city. If you find yourself in Seattle, you absolutely have to try one of these restaurants. 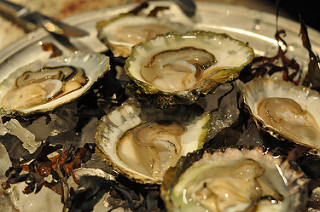 Elliot’s Oyster House, located at 1201 Alaskan Way, Pier 56, is one of the best places to get fresh seafood. Their menu boasts seafood options such as grilled scallops, blackened Pacific rockfish, oysters, and roasted lobster tail, along with non-seafood options, like steak, desserts, and wines. Best of all, Elliot’s Oyster House uses sustainable practices, recycles, and works to restore the Puget Sound. If you find yourself at Pier 56 between 10 a.m. and 11 p.m., you should definitely drop by Elliot’s Oyster House for some of the best seafood in all of Seattle. If you go a little earlier, you can catch happy hour, which takes place daily from 3 p.m. to 6 p.m., and you can get a discount on oysters by the half shell. Loved by tourists and natives alike, Blueacre Seafood has a way of bringing people together over delicious, perfectly cooked seafood. Drop by any time between 11 a.m. and 10 p.m. to enjoy their grilled whole Idaho rainbow trout, or knock back your choice of oysters by the half shell. The elegant atmosphere enhances the dining experience, and if you’re staying overnight, there are several great hotels in Seattle within walking distance of the restaurant. Blueacre Seafood also has a daily happy hour from 3 p.m. to 6 p.m. and an impressive selection of wines to choose from. Just because you’re eating some of the best seafood from around the world doesn’t mean you have to be stuck up or snooty about it. This is why people love the laid back, down to earth atmosphere of RockCreek Seafood & Spirits and all the friendly faces that work there. From 4 p.m. to 11 p.m., you have your choice of mouth-watering entrees, including Icelandic char, Casco Bay monkfish, and of course, plenty of oysters. On Saturday and Sunday, from 9 a.m. to 3 p.m., you can also enjoy a light brunch, with seafood inspired options such as the bacon & oyster benedict or tried-and-true options like buttermilk pancakes. Quietly nestled at 4300 Fremont Ave N., this restaurant has a large dining room, a beautiful patio, awesome bar, and a cozy upstairs loft for private dining, so you can dine any way you choose. Of course, this is nowhere near an exhaustive list of seafood restaurants in Seattle, but it’s a few of the best. For a more complete list, be sure to check out Seattle Magazine’s list, which gives you a better idea of the wide variety of seafood restaurants that call Seattle home. Whatever you do, don’t leave Seattle without trying their famous, fresh seafood, as you definitely won’t forget it.